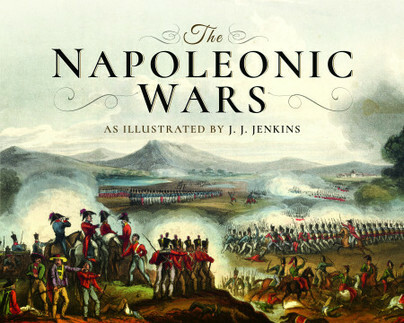 You'll be £15.00 closer to your next £10.00 credit when you purchase The Napoleonic Wars. What's this? Originally published as Martial Achievements of Great Britain and Her Allies From 1799 to 1815, this is one of the most magnificent of all period art books to have been produced. The text is pure British propaganda but is overshadowed by the rarity of the art work. Includes 54 stunning colour plates including a great Wellington portrait, his coat of arms and a list of subscribers to the Martial Achievements. This is one of the finest books of its type ever produced and an absolute must for the collector of British or Napoleonic military art and literature. While there is no doubting Jenkins’ aim of producing a tribute to Britain’s ‘glorious martial forces’, the book is far more than the pure propaganda piece that it appears to be at first glance. It contains 53 paintings of battles and other scenes (plus the coat of arms of the 33rd regiment of foot), painted by William Heath, which accompany Jenkins’ text. Each plate is stunningly reproduced in colour and they reward careful examination. The vast majority of the plates relate to battles involving British troops. Three of them illustrate disasters from the Russian campaign and another three scenes from the Battle of Leipsic [Leipzig]. The book concludes with a section entitled “The Battles of Quatre Bras and Waterloo, 16 and 18 June 1815” which features a painting of Quatre Bras and two of Waterloo (Ligny is described in some detail in the text). While the artwork is a visual feature of the book, the text makes for interesting reading with details and snippets relating to each battle (along with highlights of the British military achievements)! The book itself is beautifully presented, printed on heavy, gloss stock, making it ideal to grace your coffee table, or to add to the bookshelves of your collection. The text may cause you to puff out your chest in jingoistic British pride, to go slightly red-faced, to simply shake your head, or even feel a little queasy, but there is much to recommend. A curious and interesting book for those who love military art. The pictures contain a lot of detail – the longer you look at them, the more you see, meaning you could return to this lovely book time after time! I loved the picture of Bonaparte fleeing from Russia in Disguise. The artist must have had a particularly good imagination, and done a huge amount of research, to produce such excellent pictorial representations of events which he couldn’t have seen. J J Jenkins’ magnificent paintings accompany an extremely partisan history of the Napoleonic Wars, but then history is written by the victors, mainly. A fine art book with a difference. This book not only provides stunning images but also presents the people behind the history from the British military leaders, to the population as a whole. As such it is an enjoyable romp through a series of desperate wars, through some great artwork. Jenkins work is simply stunning, I thoroughly enjoyed this illustrated book of his work which details much of the Napoleonic period. At 168 pages it is a powerhouse review of the personalities, locations and events which dominated this period of history. The book details the period of great upheaval which the French Revolution bought forward and the great military response to the French Republic and Napoleon himself. The art work is sensational, while the supporting text is very detailed and highly accurate. This is a superb companion piece for every single period book that exists, whether your area of expertise is the French or Allies, continental battles or those of the Iberian Peninsula and Waterloo. This work by Jenkins has it all, the color rendering are by far some of the finest I have ever seen anywhere. The written work has an outstanding flow and would serve well as an introductory look into the overall period. I would more than recommend this work, it would not only be a great collection to your library but essential as a companion to other period books which usually do not contain such a wealth of color. I feel it transport the reader back into the time period and contains dramatic action of the major battles which impacted this period. The greater Pen and Sword Napoleonic period collection is vastly richer with this work included. Great price point for reader as well giving you great bang for your investment. This is one of the most magnificent of all period art books ever produced. Quite apart from the marvelous artwork by Jenkins this book offers excellent contemporary accounts of the battles of the Napoleonic Wars in which British troops were engaged. The casualty lists are most interesting as is the list of original subscribers to the book when first published. A magnificent book to slowly idle through and enjoy.